Startling, bright colours are one of the wonders of nature and no more than the carpet of blue flowers in our woodlands in spring. 1. The top spot goes to West Woods which the majority of people named as their favourite. Situated just outside Marlborough near the village of Lockeridge it’s a beautiful plantation of beech trees on a former ancient woodland site and the bluebells are magnificent. If you want to avoid the crowds Nordic Walking with Ashley have found some lovely ones on foot. Gopher Woods has some bluebells - on the walk from Knapp Hill to Oare. 2. Closer to the Dorset border and Tisbury? Try the Larmer Tree or Win Green near Ludwell is also good as well as Ashmore just over the border in Dorset. 3. On the Wiltshire / Oxon Border you’ll find Badbury Hill near picture perfect Coleshill with its secret Second World War history. 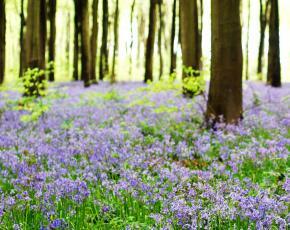 Overlooking the Vale of the White Horse it’s an Iron Age fort with a stunning bluebell woodland. 4. Devizes locals love the bluebells that grow alongside white wild garlic at Wheelers Wood on the road between Sandy lane (with its well preserved thatch cottages) & Lacock. Erlestoke wood is also a favourite and Potterne wood. The 32 acre Oakfrith Woodland in Urchfont dates back to the 18th Century and is one of the few remaining areas of significant woodland in the Pewsey Vale. In early spring bluebells cover the woodland floor. 5. If you live a little nearer Bath, Quarry Hill Woodland on Devizes Road in Box has some lovely displays. 6. Closer to Warminster the woods around Longleat are a must visit & if you head to Heaven’s Gate at the top of Prospect Hill you’ll see more while enjoying the views across the parkland of Longleat and Longleat House. 7. Malmesbury locals recommended Sommerford Common as a good spot. Go to Brinkworth and turn up Stoppers Hill towards Minety. It’s an extensive mixed woodland run by The Forestry Commission. 8. On the Wiltshire / Berkshire border the Littlecote grounds have lovely bluebells and a beautiful Roman mosaic and the remains of a Roman Villa, so get your history fix while you’re there. 9. It’s important not to forget our treasured National Trust Properties - Lacock & Stourhead both have displays of bluebells alongside other spectacular spring flowers. 10. Closer to Swindon are Ashen Copse in Wroughton & Pinkcombe wood in Hodson. Quidhampton Woods near Wroughton are on the slopes up to Bincknoll Castle, a hill fort overlooking Swindon. Take in the panoramic views while you get your fix of blue. There's also Hagbourne Copse right in the middle of Swindon. 11. Four years ago 7000 bluebell bulbs were planted by residents and the council in Milford Hollow near Laverstock in Salisbury so should still produce a beautiful display. 12. Around Calne & Chippenham Bowood House opens it’s Woodland Garden from 28th April where you can see Rhododendrons amongst the bluebells. Mortimers Wood is just south of Chippenham near Pewsham Way – a small area of ancient woodland with recorded history dating back over 800 years. 13. Jubilee Lake in Royal Wootton Bassett has lovely bluebells in its woodlands. Complete with children’s playground and tea rooms you can stay for a bite to eat or enjoy a picnic by the lake. 14. Grovely Wood in Great Wishford is the largest tract of private woodland in Southern Wiltshire straddling the Wyle and Nadder vallies. The carpet of bluebells are stunning. TAKE NOTE: Hopefully it’ll be dry and the sun beating down but if not don’t forget your umbrella!